c. 22,000 BCE The Faz join the Sentient Milieu. c. 20,000 BCE Dnyarri discovered by the Ur-Quan. c. 17,500 BCE Dnyarri overthrown, the Path of Now and Forever and the Eternal Doctrine formulated, the Words uttered and the Mael-Num driven from their homeworld. 1940 The Ur-Quan Kzer-Za begin forming plans to attack Earth. 2015 The Humans' Small War of 2015. 2019 Creation of the first Androsynth. 2025 The confiscation and storage of all weapons of mass destruction by the United Nations in so-called Peace Vaults, resulting in the first year without war on Earth. 2035 Cataclysm caused by a Deep Child makes Syra uninhabitable, forcing Syreen to flee. 2075 Yehat discover and "uplift" the Shofixti. c. 2098 Ur-Quan Kzer-Za enslave first species in our region of space (the Thraddash). Ur-Quan Kzer-Za defeat the Umgah. 2111 Ur-Quan Kzer-Za subjugate the Spathi. c. 2112 Ur-Quan Kzer-Za defeat the Ilwrath. 2112 The Chenjesu first contact Earth. 2116 Foundation of the Alliance of Free Stars. 2119 The Insult (most probably; possibly in 2126). 2134 Discovery of a Precursor facility on Unzervalt. Chenjesu and Mmrnmhrm defeated and slave-shielded on Procyon II. Humans defeated and slave-shielded on Earth. 2142 Destruction of the Gg by the Ur-Quan Kohr-Ah. c. 2145 Destruction of the Burvixese by the Kohr-Ah. 2155 Arrival of the Precursor ship at Earth; start of Star Control II's events. 2159 Start of the Kohr-Ah Death March, if not delayed or prevented. 2160 Start of the Kohr-Ah Death March, if delayed but not prevented. 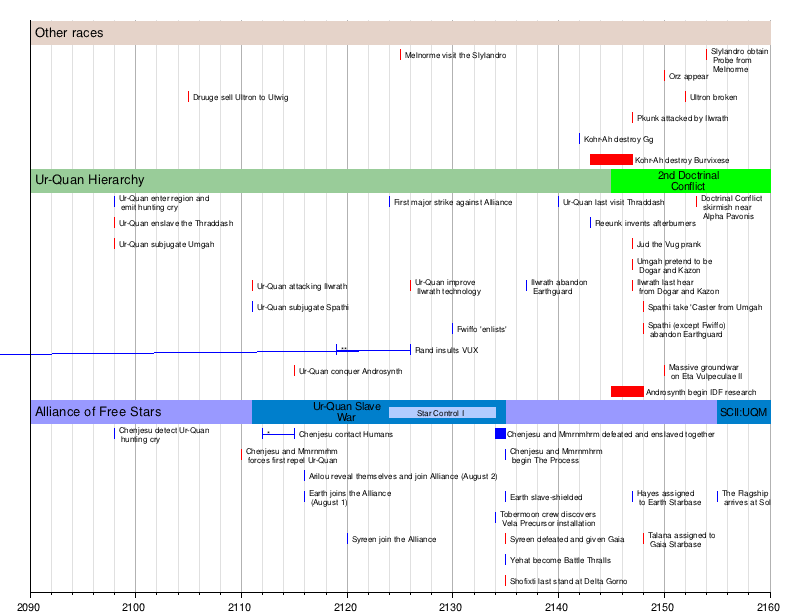 The events marked by blue are known to have occurred within a specific year or time frame. Those events marked by red represent the best-guess estimates as to when the actual events occurred. This page was last edited on 26 April 2013, at 02:27.